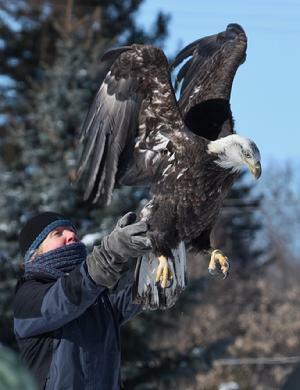 We were very privileged to witness the release of this 3 ½ year old female bald eagle February 15, 2014 at Sportsman Park in East Jordan, MI. The eagle had been injured when trying to feed on a road kill in December. She had apparently flown up and possibly hit the windshield. She was rescued and taken to a veterinarian who works closely with Wings of Wonder a rehabilitation center in Empire, MI. It was found that she had a very badly bruised pelvis. Luckily she had a fairly quick recovery although Rebecca Lessard the founder and director of Wings of Wonder stated “she refused to eat fish…she preferred rabbit, quail and steaks”. 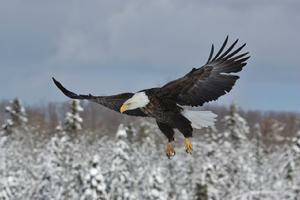 The cost of rehabilitating an eagle usually runs around $5000. The diligent hard work of volunteers and generous donations helps Wings of Wonder continue this amazing work. It was a crisp cold day…but the sun was shining as a large crowd of well-wishers gathered to witness the release. The people of East Jordan dubbed this beautiful raptor “Rebecca” in honor of Ms. Lessard. As the countdown started “Rebecca” came alive. As Ms. Lessard released her she flew straight out of her arms heading toward the river and never looking back. Eagles will usually circle back around gathering heat to help lift it up. “Rebecca” needed no help…she soared on wings of a very healthy and happy eagle. 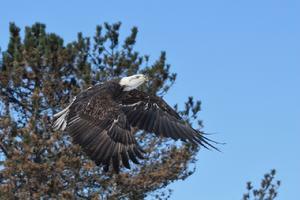 We wish her well…and hope to see her soaring around the waters of Lake Charlevoix and the Jordan River. Wings of Wonder is a non-profit raptor sanctuary located in Empire, Michigan. Since 1990 their primary goal is education. 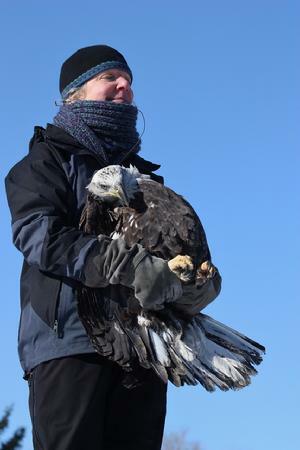 Wings of Wonder founder and director Rebecca Lessard presents more than 150 educational programs annually throughout Michigan, reaching 10,000 people each year in the hopes of fostering appreciation, understanding and respect for raptors and importance in maintaining a healthy ecosystems. Wings of Wonder is also a raptor rehabilitation and release facility. Sick, injured and/or orphaned raptors are admitted for treatment, rehabilitation, and eventual release back to the wild. All raptors are seen and evaluated by a team of veterinarians. 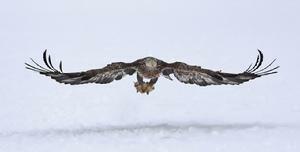 Their primary goal is to release healthy and strong raptors back into the wild. The Detroit Free Press picked up the article that Morgan Sherburne had written on us in the Petoskey News Review for the Sunday Edtion!! Thank you, Morgan, for such a well written article! This eagle spent most of one day with me at our eagle blind. At first I thought it to be a 2nd year eagle going into its 3rd year molt due to the white belly band…but on further investigation noted its beak and eyes turning more golden than that age of eagle would have. After processing my photos I was able to zoom in on its band to read the numbers. 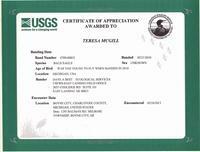 I sent the information to the Bird Banding Laboratories and they confirmed the eagle was banded on 5/21/2010. It was awesome to get confirmation on my assumption! Michael & Teresa were recently interviewed by Morgan Sherburne of the Petoskey News Review. Here is the article that appeared in the Petoskey News Review on February 20, 2013. Thank you, Morgan! Check out this article from Patrick Comins, National Audubon Society, on National Geographic News Online. Teresa was quoted in response to a photo of a possible leucistic eagle.